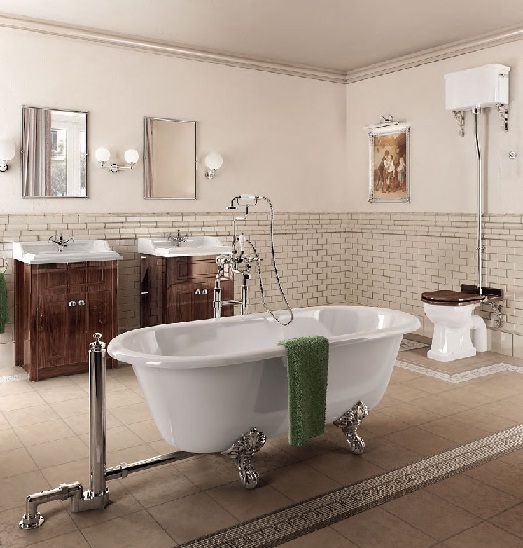 Victorian-style bathrooms are all about luxury décor items, ornate furniture, and elegance. A free-standing claw-foot tub is a must-have décor element. If you like period décor/and especially Victorian-style one/, with so many options available on the market, it is not that difficult to recreate the magic of bygone eras. The best thing is that you don’t need to completely redo your existing bathroom, at first changing the basics will do. Then, adding details will gradually bring the space to the next level – from simple and purely functional to fascinating. Note that you can always find some genuine, valuable period pieces at flea markets and garage sales, in thrift stores, or online. Anything from ornate mirrors to porcelain soap dishes to rose-patterned bath curtains can do the jobs. And the more, the better! Generally, restoring some of the classic Victorian-style features will definitely add character to your bathroom. You can start with painting your space in soft, soothing colors and add an antique or new reproduction claw-foot tub and a marble and white porcelain pedestal sink. Then focus on finding Victorian-style bronze faucets, ornate floor tiles, and vintage accessories. Don’t forget to incorporate period-inspired lighting, and voilà, you will have a bathroom with Old-world charm and tons of personality. You can always take another approach and try to combine traditional features with contemporary touches thus making your bathroom a space where old meets new. Your Victorian-style décor finds will be a nod to the aesthetics of the bygone times. As already mentioned, Victorian bathroom design focuses on beauty, elegance, and comfort. The common paint colors for Victorian-style bathroom walls are rich dark colors, such as ruby reds, dark regal greens deep burgundies, and purples. However, you can choose a color you like, makes you feel relaxed, or one that fits in the color scheme of your living space. Generally, to get an authentic look, walls should be textured. In this regard, flocked wallpaper in a floral or damask pattern is a classic option. If you don’t want to use wallpaper, traditional wood wainscoting is another décor solution. Consider also Venetian plaster and the much affordable sponged faux finish. As for the floors, you can choose from wood to marble to decorative tiles, any of these options has its advantages in terms of functionality and aesthetics. Basketweave mosaic tile or small hexagonal tiles are both traditional Victorian-style floor tile options, usually in a black-and-white pattern. For extra doses of color and visual interest, the floor can be topped with a Persian area rug. In the picture above, an adorable bathroom with a vintage look. Green walls, a black tub, an area rug, beautiful window treatment, wall art…Definitely a whimsical space where to relax in privacy and enjoy the view. Subway tiles also help create the Victorian look. As they add warmth and coziness, fireplaces are a typical bathroom feature. Dark wood/usually varnished/ is extensively used in Victorian-style bathrooms. So, including pieces of wood décor is a smart solution, which helps add to their beauty, elegance, and comfort. Anything from a toilet seat and a small under-sink cupboard to ornate mirror frames and easy chairs to beautifully carved dressing tables and tufted benches can do the job. 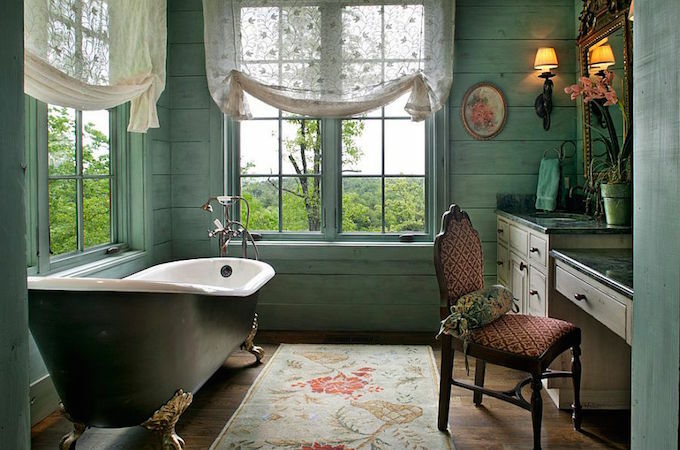 Above, an absolutely fascinating Victorian-style bathroom. Matching under-sink storage cupboards and a toilet seat in varnished dark wood add warmth and extra appeal to the space. When it comes to Victorian-style bathrooms, freestanding claw-foot tubs and pedestal sinks are definitely must-have décor items. As they epitomize the look of Victorian-style bathrooms, they actually go beyond pure functionality and help create this distinctive, unmistakable look. Above, a traditional Victorian-style bathroom. A classic white claw-foot tub is definitely an attention-grabbing décor element. Beautifully framed mirror and pieces of wall art add to the appeal of the space. These signature tubs are widely available on the market and although made from a range of modern materials, they still preserve their Old World elegance and definitely turn into a centerpiece in the space. In addition, as replicas are offered in an array of colors, you can easily find a tub to fit into the existing color scheme of your space. In the picture above, an absolutely stunning vintage-themed bathroom. 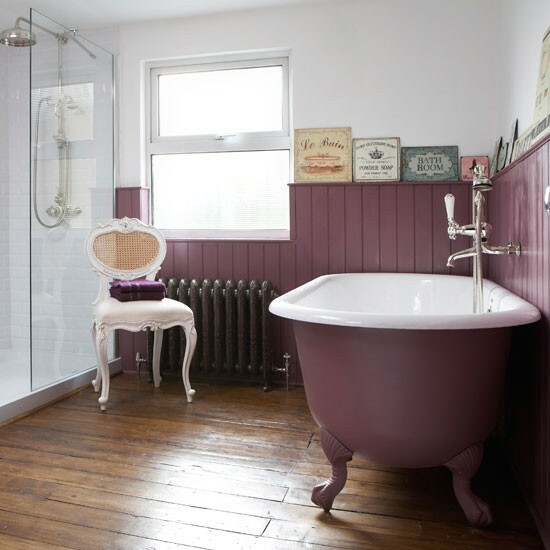 A claw-foot tub in a deep plum color complemented by paneling and accessories in the same hue create a balanced space. In addition, paneling offers a useful ledge, which can be used for storing and displaying accessories. 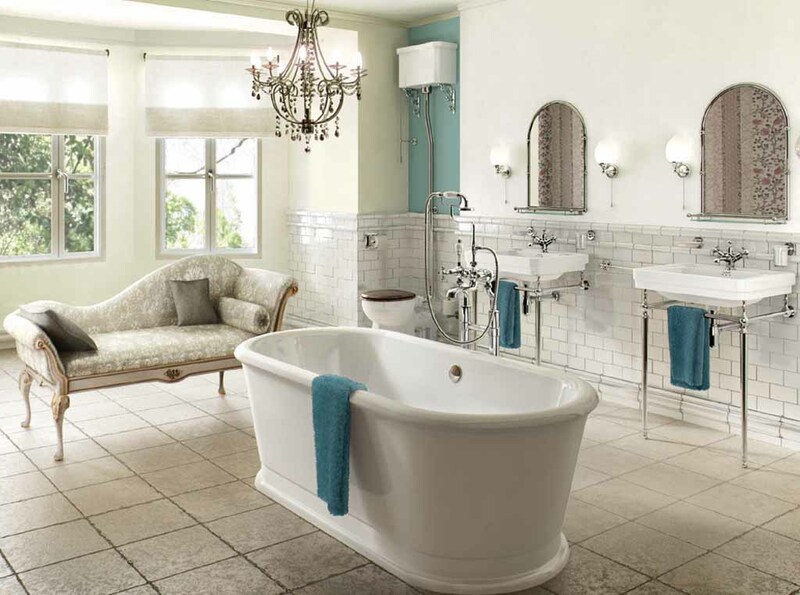 Another period-appropriate tub option is the free-standing pedestal one. Shown above is a period-perfect bathroom. A deep-soaking free-standing white tub complemented by a leggy console sink lends a Victorian look. Nickel-finish sconces and a pendant with milk-glass shades offer soft lighting. A curvy glass-topped wrought-iron table brings in artistic touches and visual interest. Accessories add to the appeal of the space. 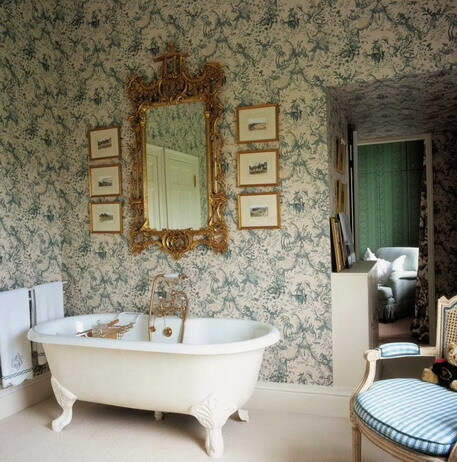 This is definitely an exemplary Victorian-themed bathroom! In Victorian-style bathrooms, sinks with separate hot and cold water taps sit atop a porcelain or metal base. They should be large and square/for storage on the sides/, and, if possible, with storage underneath. Note that marble or bronze sinks topped on antique chests of drawers are also common. Toilets, on the other hand, were with a wood seat and a porcelain cistern hanging high up and operated by a pull chain flush. In the picture above, another exemplary Victorian-style bathroom. This airy, flooded with natural light space incorporates a period-appropriate bathtub and toilet as well as two matching sinks. An elegant piece of furniture and a chandelier add touches of elegance, luxury, and sophistication. Do not underestimate lighting, it is of crucial importance for any space. Adding period-style lighting fixtures will help get that charming Victorian look. Sconces and/or vanity lights with frosted shades are a common option. For large bathrooms, chandeliers, usually crystal ones, add extra light, visual interest, and glam to the space. Both period-appropriate reproductions and antique finds can do the job. Of course, for extra doses of charm and romance, you can always arrange candles wherever you like in your bathroom. 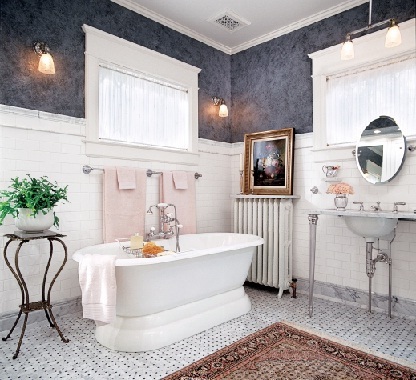 Shown above, a fascinating Victorian-inspired bathroom. Sconces flanking the mirrors and a chandelier provide artificial light to this flooded in natural light space. In terms of furniture, tubs, sinks, and showers hardware, brass or gilt-metal ornate designs with flora, fauna, and scroll sculpted elements are common options. Reproductions of Victorian-style hardware and accessories are widely available on the market. Furthermore, they can be found in antique shops. So, you can easily find period-appropriate items to put the finishing touches to the look of your Victorian-inspired bathroom. 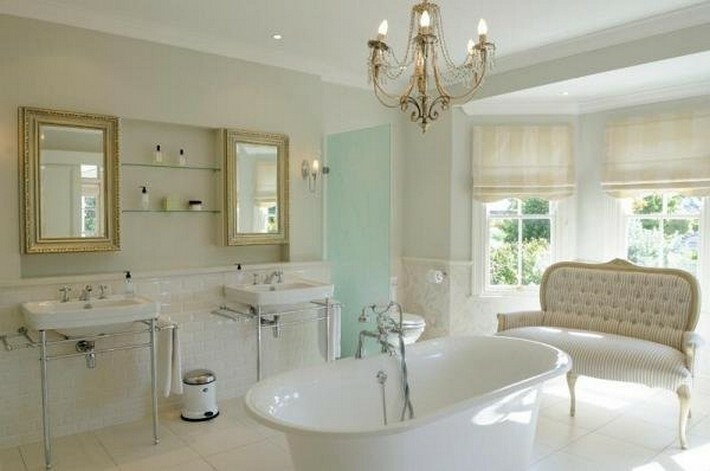 Consider adding a radiator and a towel rail, they are must-have elements of the Victorian-style bathroom. Cast iron towel rails mimicking the classic ones are available on the market, so you can easily add both functionality and extra doses of Victorian look to your bathroom. 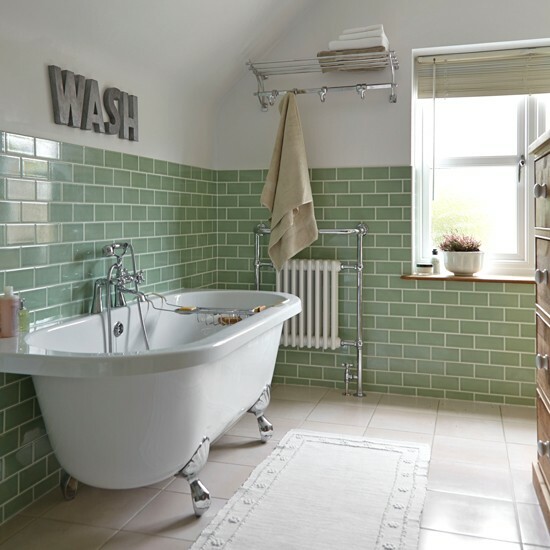 Above, an appealing green bathroom with personality. A radiator and towel rail help to add Victorian-style touches to the space. As Victorian-style décor is opulent, dramatic, and elegant, you can easily get the look by adding period-inspired accessories. Beautifully framed painting and photos used as wall art or arranged on the radiator, luxury window treatment and cotton towels, accessory sets, candle holders, floral-patterned shower curtains and screens will definitely add to the appeal of the space. Don’t forget about the flowers, they always are a stunning way to freshen up a space and bring in extra color and organic beauty! Above, an amazing bathroom in pastel colors. A yellow tub definitely makes a statement. Fresh flowers add some extra color and charm. Actually, do you like Victorian-style décor?